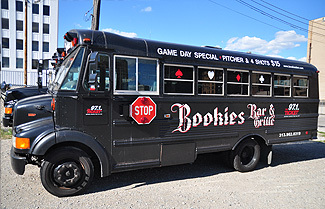 Bookies Bar & Grille offers complimentary shuttle service to all Detroit Tigers, Detroit Lions, and Red Wings events, as well as, Major Downtown Concerts. Shuttles begin running approximately 1 hour before scheduled game time and 2 hours after the game or concert ends. For additional shuttle information or to request a special pick-up. Bookies Bar & Grille is the place! To request a special shuttle pickup click here!